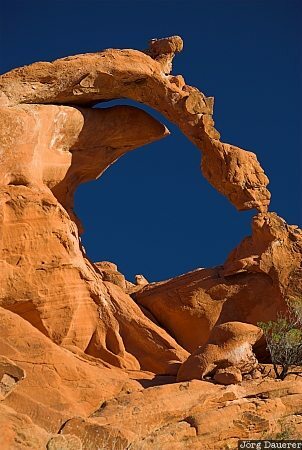 The delicate sandstone natural arch "Ephemeral Arch" in Valley of Fire State Park in southern Nevada, United States. Unfortunately this arch had collapsed May of 2010. This photo was taken on a sunny day in October of 2006. This photo is part of the exhibition Natural Arches (June 2014). This photo was taken with a digital camera.